Two off machine supplied back to BMW Mini plant and three to BMW Swindon Pressings. 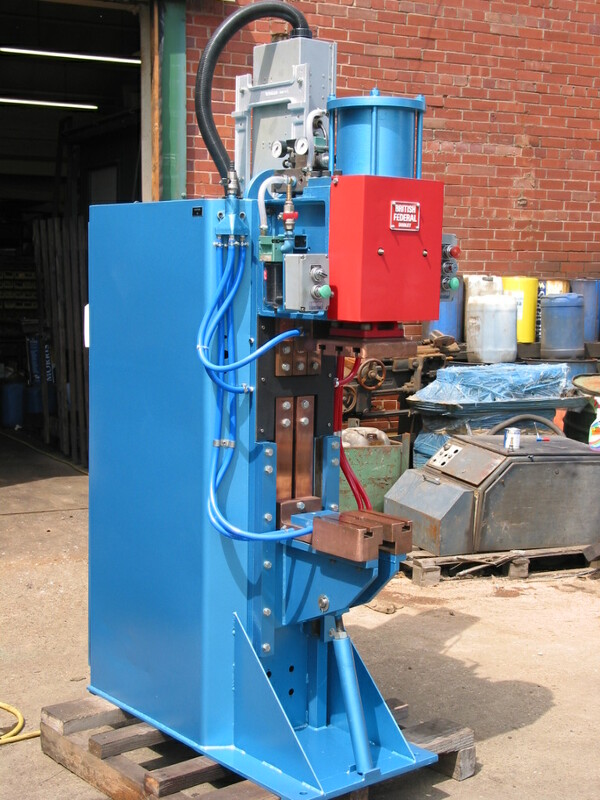 Remove troublesome grease loaded compensating tool from de-coiling line at Bosal Exhaust Preston and fit two off specially configured 25KVA bench spot welding machines with Welserv weld timer monitor units. Heat step with 5 separate schedules used to prolong tip life when welding aluminium coated steal. Machines perform in the region of 1000 weld per hour and feed the whole Bosal plant with de-coiled welded and slit steel. Design and manufacture special welding machine for Stadco Tipton to produce left and right hand assemblies for the BMW Mini Stiffener Bracket. Twin loading bays each with three off Obara welding guns to apply three off spot welds per part. All parts are presence sensed. Welserv Weld Timer Monitor unit used to ensure weld quality. Contracted cycle time was 27 seconds, actual cycle time is 14 seconds per complete part. Machine muddled in Catia prior to manufacture in order to model prices gun compound angles. Special purpose welding cell designed and manufactured for Stadco Tipton to produce BMW Mini Trailing Arm Assemblies. Machine produces left and right hand assemblies with four spacer and duo nut stacks welded in sequence. Once component is complete it is automatically ejected into the stillage to the left of the machine. Machines are fitted with 150KVA welding transformers welding at 26KA on tap 2, capable of producing 1000 pairs per day, 140000 pairs produced to date. All component parts are checked for presence and orientation. · Welserv Graphics Display for in process SPC · Nut Depth Draw Wire Sensing accurate to .5mm · Nut Feeder Interface Socket. Take second hand machine frame and re-tool to weld Land Rover wheel well. Machine fitted with new SMC double cylinders, tooling and consumables supplied by RWS and weld timer monitor unit fitted to sequence machine. Machine welds 1 off M6 and 3 off M8 weld nuts, control uses clamp cylinder to ensure that component is completed before removal and four independent programs with monitoring to ensure weld quality.